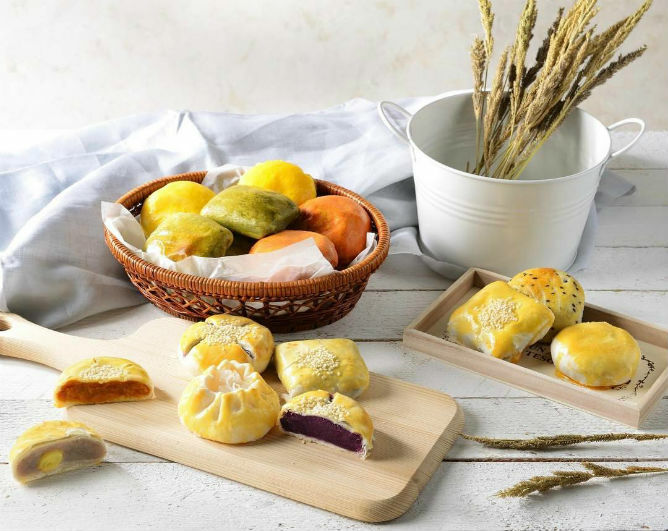 You don’t have to travel far to devour authentic cuisine around the world – from Japanese cheese tarts to Taiwanese sponge cakes, check out all the latest international outposts that have landed in Singapore. Time to round up you K-foodie crew! 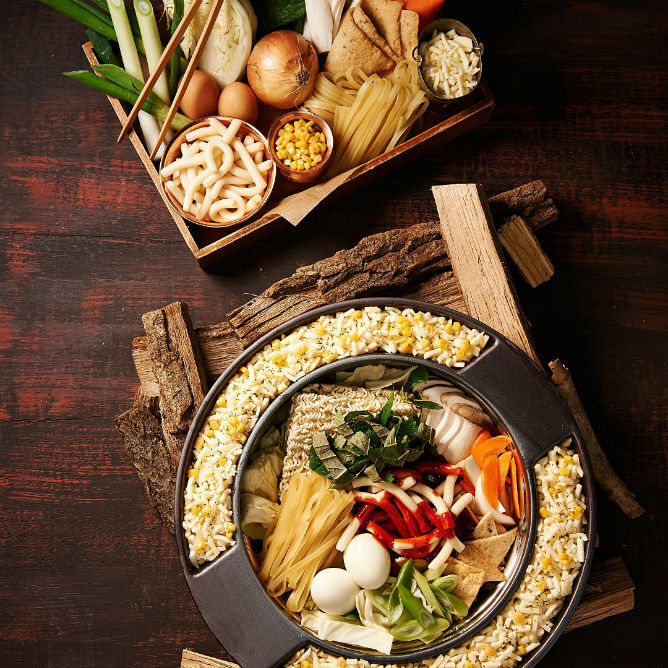 South Korean F&B franchise Dookki, which has over 100 outlets around the world, is not your typical all-you-can-eat destination – enter Singapore’s first tteokbokki (rice cakes) buffet restaurant which is known for its unique two-meal dining concept. At just $18.80, you can enjoy an endless carb-loaded feast in a simmering hotpot along with an assortment of ingredients to choose from; then finish the meal kimchi fried rice cooked with leftover tteokbokki sauce (you can DIY you own customisable sauce!). But here’s where the real fun starts: order the Double Cheese Ring at an extra $9.80, which comes served in a molten ring of dippin’ goodness. Can anybody say “cheese pull”? Pies are having a huge moment now thanks to the arrival of April’s Bakery, the Bangkok-based establishment well-loved for its homemade Cantonese-style pastries ($2 each). Think of it as your traditional wife biscuit/sweetheart cake with a contemporary twist. Look forward to a colourful medley of sweet favourites like taro, matcha and black sesame as well as savoury options like honey pork and honey chicken. Although, it’s hard to go wrong with any of the flavours – and it doesn’t hurt that they are all equally instagrammable – the Thai milk tea is hard to beat. Psst, this one’s a bestseller so be sure to head down early if you want in on the cha yen action! It’s no secret that Singaporeans love to queue, so it isn’t surprising to see snaking lines outside LE Castella’s newly opened local outpost – all ready to sink our teeth into these Instagram-approved blocks of fluffy sponge cakes. And you know the hype is real when people queue simply to witness the showmanship, where freshly-made batches of Castella cakes are wheeled out every 15 minutes to be flipped and sliced before being stamped with the brand’s logo in all its jiggly glory. Limited flavours are available as of now – original ($9.90), Cheese ($11.90) and the soon-to-be-launched Chocolate – but we heard they’ll be rolling out a uniquely Singaporean flavour soon so keep that kiasu streak going! Can’t get enough of the cheese tart wave? Hot on the heels of BAKE, “the most famous cheese tarts from Japan” is set to spark another frenzy. Come July, Osaka-based franchise PABLO will be serving up their signature 15cm cheese tarts (from $13) at their new 80-seater café in the heart of Orchard Rad. 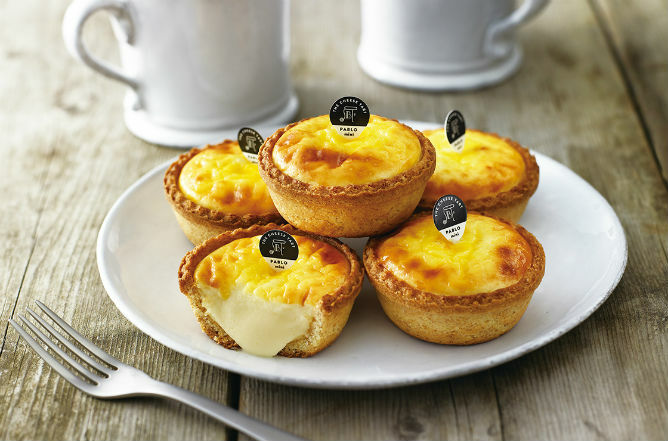 Flavours include cheese, matcha cheese and chocolate cheese, but we recommend the premium cheese tart which is lightly torched to create a candied glaze that cracks satisfyingly on top of its creamy cheese filling – it’s pretty much crème brulee in a tart form! In addition, to the baked goods, you can also expect other cheesy delights ranging from smoothies to cookies and even iced coffee topped with cheese soft serve (yes, it’s a thing!). This article was adapted from the Teenage July Issue 2017, out on newsstands now. Did any of these delicious international treats catch your eye? Tell us which did in the comment section! One of the many instructors will brief you before you venture into virtual world, and the thought of entering a new reality might get you understandably apprehensive. But just like Chloe and Vivien, laugh it off, hold back your nerves and expect the unexpected. You’ve got this! Once you’ve donned the VR goggles and gotten ahold of a suitable controller, get ready to have your senses fully immersed into a brand new world – just like Maya did… albeit a little too much. Be cautioned that VR games will promptly dive your conscious right into a new state of environment and make you oblivious to your actual surroundings, which could result in you being an unpredictable hazard. Try to avoid walking into a wall or hitting your unsuspecting friends! After a couple of unsuccessful attempts, chances are you’ll slowly get accustomed to the game controls and familiarising yourself with the hand-eye coordination needed to ace the VR game. Take a cue from Don and remember to keep your patience and maintain your composure to master the art of racking up the perfect score. #NailedIt! Like Joanna, there’s a strong chance of becoming the unknowing victim of your friends’ playful teasing and taunting while having your turn at the VR game. Being unaware of what’s going on around you in the real world works to your disadvantage, but it’s sure to incite shared laughter when you realise your friends’ antics. Otherwise, be the jokester like Derrick and take revenge on them during their round! For more information on having your own virtual experience fun, check out V-Room! You’ve got to admit that food makes up a huge part of our identity as Singaporeans. Be it Chinese New Year, Deepavali, or even Christmas, the arrival of these special celebrations brings about a plethora of yummy delicacies. Similarly, Hari Raya Aidilfitri also comes with its own special set of treats and goodies that you can find when you visit friends and family members at their ‘open house’. The treats that you usually find inside of jars or served on a tray in the living room are called ‘kuih raya’! Below is a guide to five of the most common kinds of kuih raya you’ll encounter at a typical Hari Raya open house. 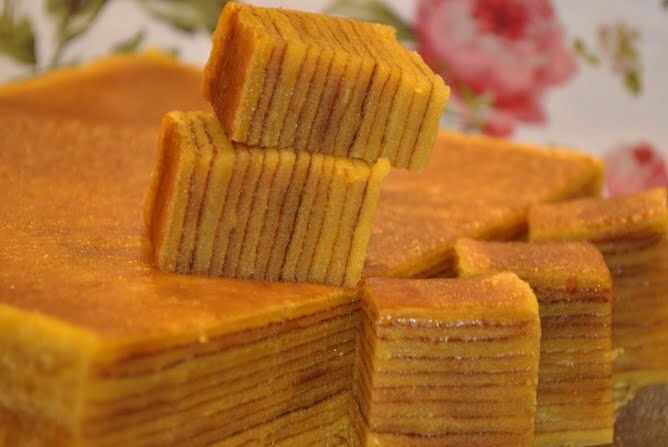 The Kek Lapis happens to be one of the most common kuih of all, and you can usually find it at most of the open houses you attend. Its name literally translates to ‘layer cake’! This particular kuih also comes in alternate but equally delicious forms such as lapis prune, lapis durian and even lapis oreo! The Malay word ‘Tapak Kuda’ translates to ‘horse foot’ and we can totally see why! This hooved-shaped delicacy is made up of a chocolate filling surrounded by a spongey vanilla-flavoured exterior. Another mouth-watering variation includes a chocolate filling made entirely out of Nutella! This sugary treat comes in various colors like white, yellow and even green at times! Butter, ghee and flour are combined to create the shell-like outer layer while the inside of the kuih is filled with coarsely chopped peanuts. To top it all off, the Kuih Makmur is then coated with a layer of icing sugar. Did someone say sugar rush?! The Kuih Tart is no stranger to the average Singaporean as these goodies pop up during Chinese New Year and Deepavali as well! The copious pineapple filling is surrounded by a sweet doughy crust that simply melts in your mouth when you bite into it. Yum! These little golden baskets of goodness are a hit among adults and children alike. It’s astounding how such a basic kuih made from basic ingredients can taste so good! 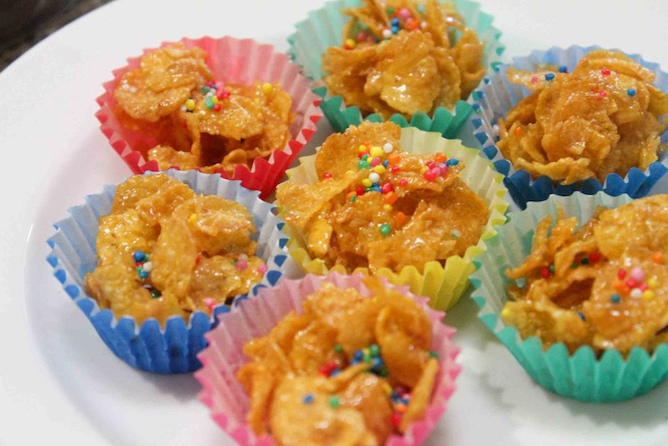 Combine sugar, honey, butter with a bowl of cornflakes and voila! Don’t forget to leave some for the other guests! Avoid wearing too revealing or tight-fitting clothes when you visit Muslim friends for their Hari Raya open houses. Instead, wear something modest and comfortable as a form of respect to your host and the culture. Or even better, try out the baju kurung look for the day! Avoid using your smartphones to surf the net or the various social media sites. Instead, socialize with your host and friends! Take this opportunity to mingle with new friends and catch up with old ones over good food and drink. We’re sure scrolling through Facebook can wait till later. Feel free to indulge in the food and drink provided by the host! As the hosts of the open house, it is their duty to ensure that your belly is filled before leaving. Hence, declining to partake in the lovely spread may hurt the host’s feelings. 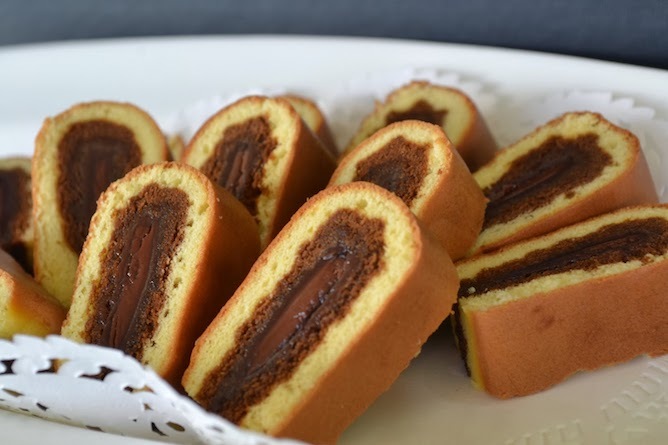 Have a small bite at least, otherwise enjoy the kuih raya provided! Because Hari Raya is known as a day of giving, the host may sometimes hand out little green packets filled with small amounts of money called duit zakat (think angpows). Always remember to say thank you and open them only once you have left! 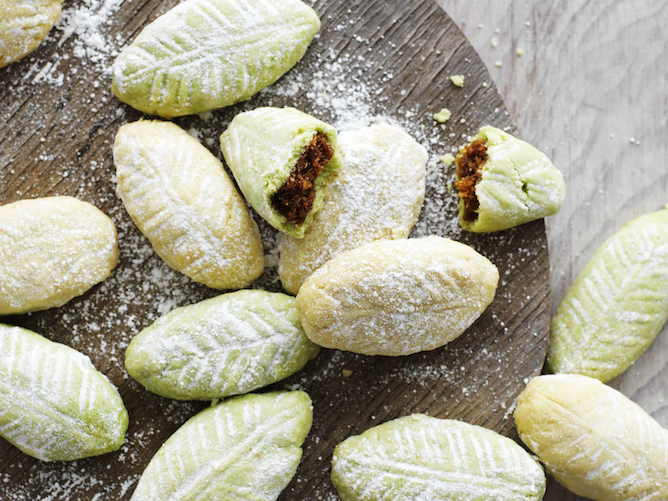 Do you make your own kuih raya? Tag us (@teenagemagazine) in your Instagram photos and you might just be featured! Don’t deny it – we are all guilty of certain behaviours at a cafe or restaurant. We recently sent our TGY! 2017 finalists to Food Anatomy and Dal.Komm Coffee, where they not only enjoyed lending their tastebuds to all treats sweet and savoury, but also effortlessly exemplified the different types of patrons we all (secretly) are, or could be. Whether you’re visiting a new cafe with your partner or a newfound BFF (like Joanna and Derrick), sharing your grub with someone else truly shows your affection for them. After all, food = love, doesn’t it? Feelings aside, it’s also a practical way to get more bang for your buck, since it allows you to let your palette sample different kinds of menu options while only paying for your share. Win-win! 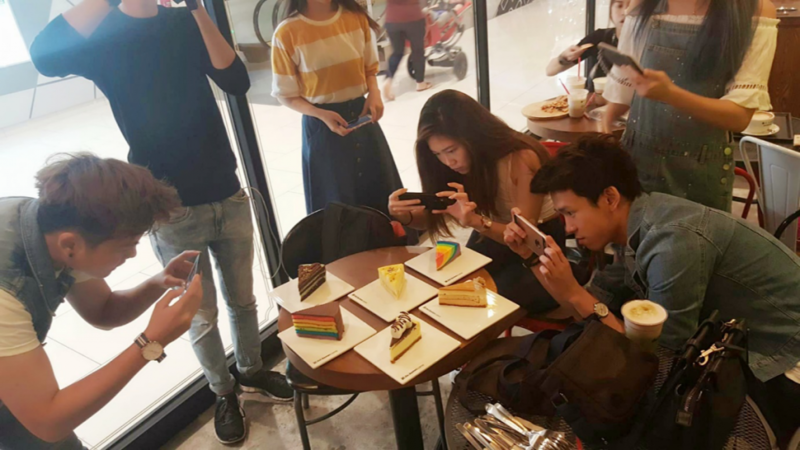 An easy one to spot; just a quick scan around your food haunt will likely help you realise that you’re not the only one with your phone whipped out, ready for that #InstaFood shot. Digging in can wait – taking food shots serve as a great way to document memories and places you’d want to make a return to in the future, or recommending them to fellow cafe-devotees with photographic proof. But that’s not to say getting the right angle is always straightforward – just look at Chloe‘s intense concentration! Not everyone prioritises food destinations just for the meals! For fans of themed cafes, the merchandise and ambience are also important factors to immerse yourself in the whole experience. 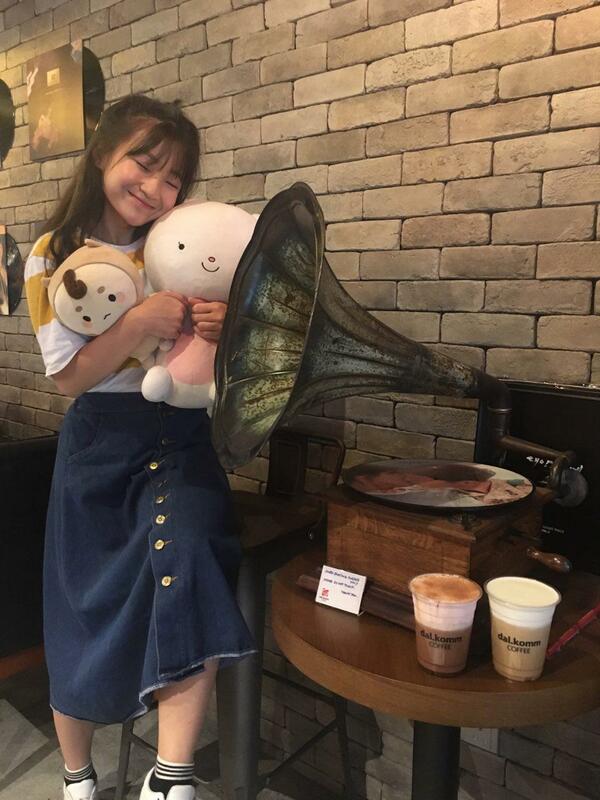 Joyce knows what we’re talking about, immediately making a beeline to the familiar character plush toys seen in Descendants of the Sun for a quick squeeze! It’s hard not to critique what we get served, since discovering new tantalising delights is Singaporeans’ #1 favourite pastime after all. Let’s be honest: most of us can’t help but chime in with our opinions on our orders – from the texture to the plating, the taste to the Instagrammable factor etc. Donny and Tyler sure had more than a few compliments about their delicious cube bites from Food Anatomy! Then there are ‘The Connectors’, that commit to the challenging task of putting away their phones for the duration of the meal and indulge not just in gastronomic fare, but in heart-to-heart conversation as well. 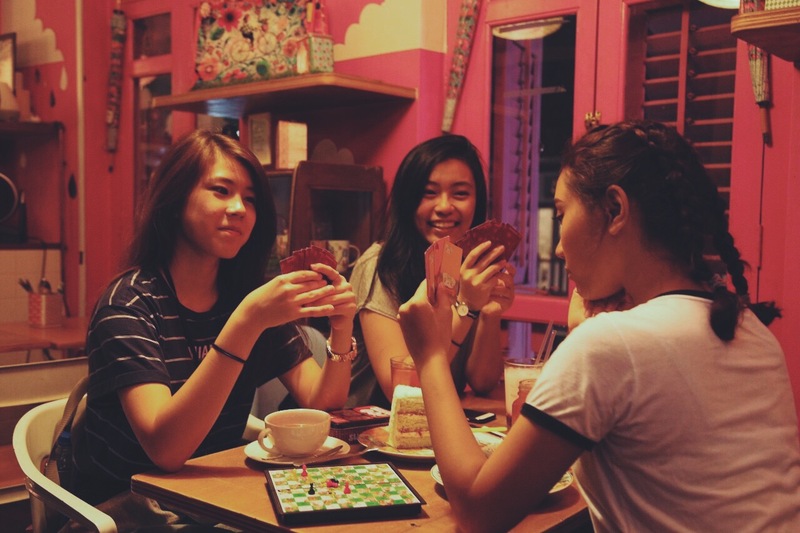 Jessica, Maya and Syahira evidently bonded over a game of cards and hearty laughs at their cafe trail! After all, isn’t growing closer to those around you the whole point of meeting up in the first place? Which type of cafe/restaurant person are you guilty of being? Let us know in the comments below! Beat The Summer Heat With These Frozen Treats! The notorious Singapore heat has been relentless in recent days, with temperatures holding steady within the 30ºC – 35ºC range during the mornings. Luckily for us, there are a host of frozen treats available that we can sink our teeth into whenever we want a respite from the scorching heat – here are our top picks! Soft, pillowy mochi loaded with some of our favourite ice cream flavours? Yes please! A frequent standout at events like Artbox Singapore and iLight Marina Bay’s Gastrobeats, this Bangkok-based establishment – Kanemochi – features classic flavours like Mint Chip and Korean Banana Milk ($2.30), to the premium Cookies & Cream and Thai Iced Tea ($2.60). While it’s good enough on its own, you can also choose to complete your mochi ice cream with one of their dessert sets, whether you prefer it served with Belgium waffles ($9.80) or fancy an extra dose of fondue goodness ($10.80). But our favourite combo has got to be the Waffles Fondue Set ($18.80), because why not have the best of both worlds? 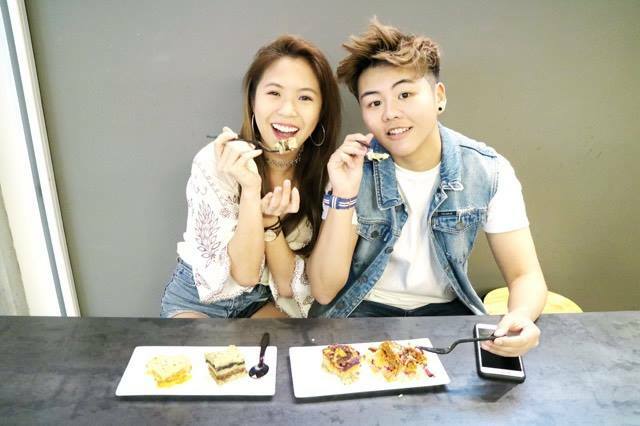 From Nunsongyee to Bing Jo Gung, there are no lack of Korean dessert houses in Singapore. But when it comes to the variety of bingsoo (shaved ice) options available, Patbingsoo Korean Dining House is hard to beat. Named after Seoul’s metro stations, innovative flavours include the Sinsa Patbingsoo ($14.90),served in half a rockmelon and accompanied with a delightful medley of red beans, nata de coco and corn flakes. But the ultimate show-stopper of a dessert has got to be the Bibim Patbingsoo ($11.90),a sweet take on the traditional dish topped with a sunny side-up cleverly replicated with a peach for the yolk and vanilla ice cream for the white. Not in the mood for some bingsoo? The eatery also offers a wide selection of savoury items such as their signature Rolling Cheese Pork Ribs ($38.90), featuring juicy pork ribs coated in grilled cheddar and mozzarella cheese. Move over, lava cakes. It’s time for molten lava cookies to take the centre stage, and shine under the spotlight they do. Touted as the original brainchild of the lava cookie, Bangkok-based dessert chain Creamery has finally made its way to our craze-lovin’ city. Made fresh from scratch daily, these avalanches of gooey goodness – Choc-a-lot, Monster Matcha and Red Devil ($8.90) – ooze your choice of chocolate, matcha or cream cheese lava when topped with a scoop of ice cream. But if you’re just in the mood for some ice cream, you can sink your teeth into their equally intriguing selection of flavours – think Piko Piko (a creamy tiramisu concoction of mascarpone cheese, chocolate fudge and kopiko coffee candy) and Counter Strike (a pistachio-inspired combo of caramel and chocolate fudge). Oh the memories of heading over to the neighbourhood mama shop to grab these 10-cent ice lollies after school… Bringing nostalgia back in the coolest form, local startup The Sng Bao Society gives a hipster remake to our favourite retro popsicles – complete with a modern uplift and updated flavours (from $3) such as Thai milk tea, stylo milo, lychee mint and solero lime. While these frozen gems can only be found at pop-up markets and various public events for now, we heard that they’ll be stocking up at Naiise outlets soon so keep a lookout on their social media platforms for updates! In theory, liquid nitrogen and ice cream sounds like an experiment waiting to go wrong. In reality, it’s frozen delight in every mouthful – and Lab Made Singapore has the science perfected to a craft. This is how it works: instead of the commercial method of freezing ice cream, the popular Hong Kong laboratory blasts cold liquid nitrogen to flash-freeze their ice-cream mixture, resulting in a smoother and creamier texture. Plus they change up the flavours every few weeks so you’ll be in for a sweet surprise with every visit – all the better for your Instagram pics! Bestsellers include the Crunchy Sea Salt Caramel, HK French Toast, Beancurd Dessert and the highly-raved Liu Sha Bao. Artisanal gelato parlour or whimsical flower shop? Birds of Paradise looks to be a combination of both and we love it either way. Decked out in delicate blooms and filled with the aroma of fresh herbs and spices, this aptly-named piece of paradise creates botanical magic out of natural ingredients to concoct flora-infused flavours such as spiced pear, white chrysanthemum and strawberry basil ($4.70 for single scoop, $7.70 for double scoop). The 600 sqft space caters mainly for takeaways, but you can stand along the leaf-shaped counter table to savour your treat while snapping away at the pastel-perfect surrounds – ideal for that perfect Instagram shot! If ice cream on waffles ain’t hipster enough for all you cafe-hopping fiends, check out Geometry where they serve up rich, creamy gelato on their signature French Tart ($9.90). Buttery on the outside and chewy on the inside, these handcrafted tarts come with a decadent almond filling and a towering dollop of salted caramel floss atop your choice of ice cream. Don’t expect the typical vanilla and chocolate suspects either – these guys dream up quirky flavours from the likes of Lovepotion Sorbet (white peach, lychee, strawberry and raspberry) and Sunset Kiss (mango and strawberry). What’s perfect for Instagram: the Bing Bong (yes, it’s a homage to the fluffy pink elephant in Pixar’s Inside Out) reminiscent of the ‘paddle pop’ ice cream of our childhood. This story is an adaptation of “Ice Ice Baby”, originally published in Teenage June 2017 Issue 342, out on newsstands now. What are some of your favourite cold treats to indulge into? Tag us (@TeenageMagazine) in your photos and you might just be featured!